A new analysis of the prehistoric origin of malaria suggests that it evolved in insects at least 100 million years ago, and the first vertebrate hosts of this disease were probably reptiles, which at that time would have included the dinosaurs. Malaria, a scourge on human society that still kills more than 400,000 people a year, is often thought to be of more modern origin – ranging from 15,000 to 8 million years old, caused primarily by one genus of protozoa, Plasmodium, and spread by anopheline mosquitoes. But the ancestral forms of this disease used different insect vectors and different malarial strains, and may literally have helped shape animal survival and evolution on Earth, according to George Poinar, Jr., a researcher in the College of Science at Oregon State University. Poinar suggested in the journal American Entomologist that the origins of this deadly disease, which today can infect animals ranging from humans and other mammals to birds and reptiles, may have begun in an insect such as the biting midge more than 100 million years ago. 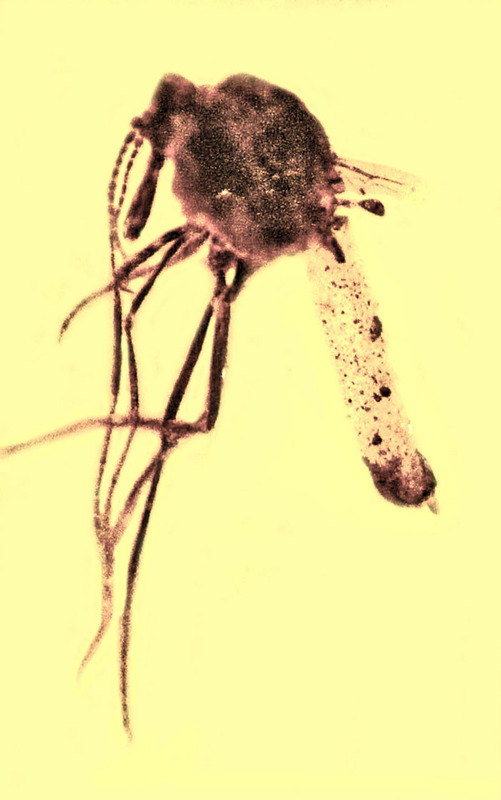 And in previous work, Poinar and his wife, Roberta, implicated malaria and the evolution of blood-sucking insects as disease vectors that could have played a significant role in the extinction of the dinosaurs. Since the sexual reproduction stage of malaria only occurs in insects, Poinar said in the new study that they must be considered the primary hosts of the disease, not the vertebrate animals that they infect with disease-causing protozoa. And he believes the evidence points toward the Gregarinida as a protozoan parasite group that could have been the progenitors of malaria, since they readily infect the insects that vector malaria today. Understanding the ancient history of malaria evolution, Poinar said, might offer clues to how its modern-day life cycle works, how it evolved, and what might make possible targets to interrupt its transmission through its most common vector, the Anopheles mosquito. 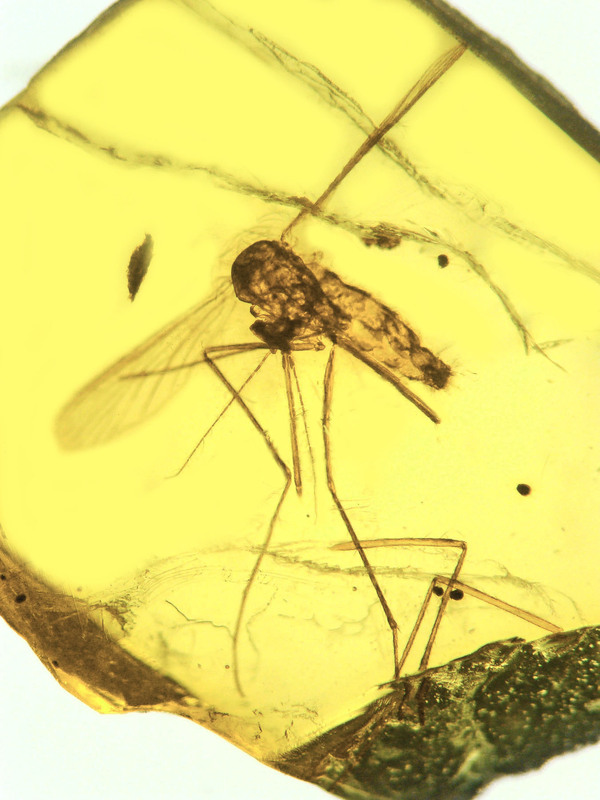 Understanding the evolution of malaria also takes one on a worldwide journey, according to evidence found in insects preserved in amber. Poinar is an international expert in using plant and animal life forms preserved in this semi-precious stone to help learn more about the biology and ecology of the distant past. Poinar was the first to discover a type of malaria in a 15-20 million-year-old fossil from the New World, in what is now the Dominican Republic. It was the first fossil record of Plasmodium malaria, one type of which is now the strain that infects and kills humans. Even further back, malaria may have been one of the diseases that arose, along with the evolution of insects, and had a huge impact on animal evolution. In a 2007 book, “What Bugged the Dinosaurs? Insects, Disease and Death in the Cretaceous,” George and Roberta Poinar argued that insects carried diseases that contributed to the widespread extinction of the dinosaurs around the “K-T boundary” about 65 million years ago. Avian malaria has been implicated in the extinction of many bird species in Hawaii just in recent decades, especially in species with no natural resistance to the disease. Different forms of malaria, which is now known to be an ancient disease, may have been at work many millions of years ago and probably had other implications affecting the outcome of vertebrate survival, Poinar said. The first human recording of malaria was in China in 2,700 B.C., and some researchers say it may have helped lead to the fall of the Roman Empire. In 2015 there were 214 million cases worldwide, according to the World Health Organization. Immunity does not occur naturally and the search for a vaccine has not yet been achieved.